Our Watch Repair Department offers the most comprehensive after sales repairs and service. All repairs are performed on premises. Our watch technicians are trained at the best technical schools and major watch manufacturers and have at least 25 years of experience. Even a simple battery replacement requires specific training and knowledge. Proper care and periodic maintenance will ensure that any complicated mechanism will perform to its best potential. 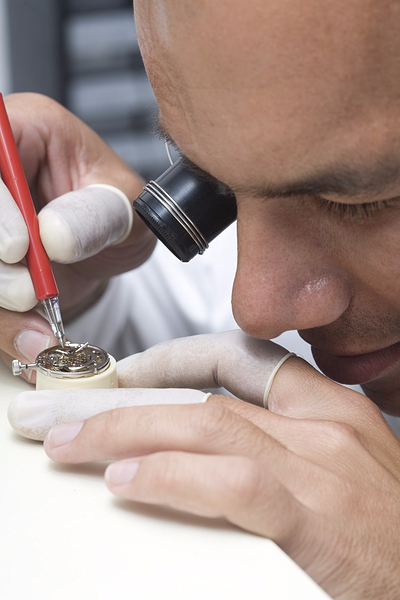 Our technicians will carefully examine your watch using a microscope and a state of the art watch analyzer in order to evaluate the condition of the watch. We provide free estimates on all watch repairs using original parts. The watchmaker disassembles the watch and then uses a highly sophisticated watch cleaning machine (ELMA). After cleaning the watch he assembles it by hand using 7 different synthetic oils. After the watch is assembled he will electronically time the performance in various positions using the most advanced timing machine “WITSCHI”. Case and bracelet are carefully examined and finished to original luster using high/low speeds buffing equipment. The servicing of your watch is completed with the final assembly and testing with dry and wet water resistant equipment. Once your watch has met the standards that watch manufacturers require, we will return the watch to you with a 1 year warranty. Our Jewelry Specialists have been designing, manufacturing, adjusting and repairing Jewelry since 1995 right here in our Store. We can repair rings, necklaces, bracelets, earrings and any other Jewelry. Repair services include ring sizing, retiping prongs, diamond and gemstone resetting, stone tightening and soldering. We can also replace half and full shanks, heads and prongs. The precise and delicate nature of jewelry work requires experience, good hand-eye coordination, concentration and artistic ability. 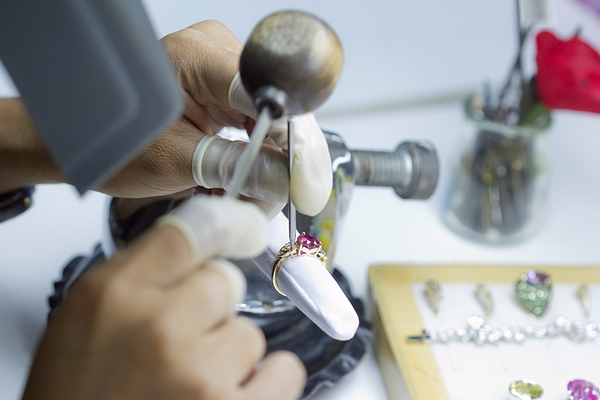 Our jewelers went through highly sophisticated training and have more than 25 years of experience .